Couscous are tiny balls of dried dough, made from durum wheat semolina. Semolina is a course flour, ground from durum wheat. Durum wheat is a type of hard wheat, with a pale yellow endosperm, used to make pasta. So both pasta and couscous are made from Durum wheat. Couscous is traditionally cooked by steaming and served like rice. It can be served hot or cold. Properly steamed couscous is light and fluffy and pleasant to eat. Couscous is a staple food throughout North Africa in countries like Morocco, Algeria, Mauritania, Libya, Egypt and from Chad to Senegal and eastern Arab countries. 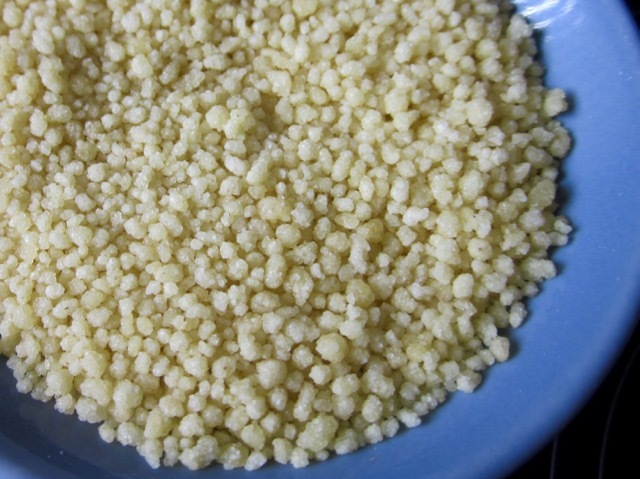 The couscous sold in western supermarkets (instant couscous) has been pre-steamed and dried and is rehydrated by adding 1.5 cups of boiling water or stock to one cup couscous and letting it soak, covered for about 5 minutes. It’s much easier to prepare than the traditional one. Couscous is made from durum wheat semolina (a course flour milled from durum wheat). Traditionally they use freshly ground whole durum wheat. Traditionally, semolina is sprinkled with cold salted water and then rolled with the hand to from small pellets. The small pellets are sprinkled with dry flour to keep them separate and then passed through a sieve to separate the small ones that don’t meet the required size. The smaller ones undergo the same process of wetting with cold salted water, rolling into pellets and sprinkling with dry flour until all the grains are used up. The formed pellets are dried in the sun and stored. The process of couscous production is now mechanized, but traditionally several women come together to share this laborious process of couscous making. 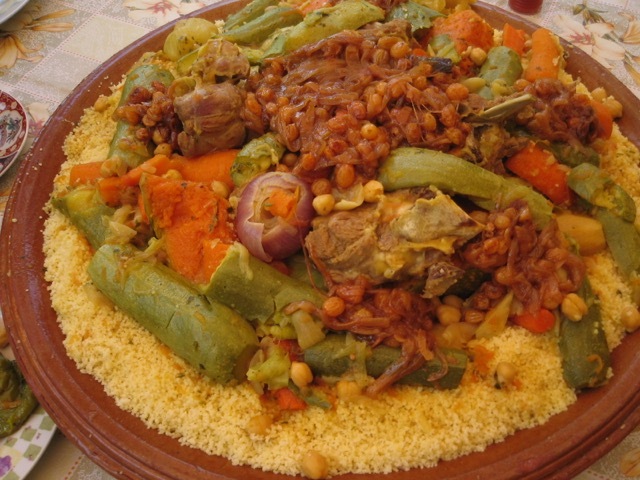 In North Africa, couscous is steamed in a traditional steamer called Taseksut or couscoussier (French). 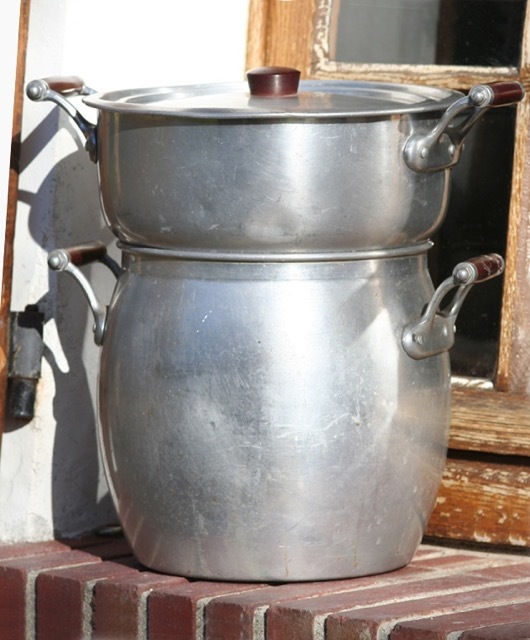 Meat or vegetable stew is cooked in the bottom pot and couscous is placed in the top pot and covered. The lid has several holes around the edge to allow steam to escape. As the stew bubbles in the lower pot, the steam cooks the couscous and the flavour from the stew infuses into the couscous. Couscous can be steamed over stew and used as you would rice, or steamed over water and then flavoured with milk or yoghurt. Couscous is a staple food like rice so it’s generally served with vegetables or stews/curries made from all kinds of meat including chicken, lamb, mutton, fish, seafood or camel meat. Couscous can also be made into a dessert. Pale fluffy couscous is sprinkled with cinnamon and sugar and served with flavoured milk or buttermilk. In Egypt it’s eaten as a dessert. Fluffy couscous is prepared with butter , cinnamon, raisins and topped with cream. Couscous is also eaten in Spain, Portugal, Italy and Greece. Once dried, couscous can be kept for months or years. Prev What is Baking Powder? Couscous is a delicious almost rice-comparable food that you eat and enjoy, my personal experience was from a Moroccan family friend that used to cook it and send it over. I am sure you can find some in your local stores! (here in Michigan we have sections for all types of cuisine) so experimenting never stops. I live in a very small City, maybe I can find some in Toronto. Next time I’m in Toronto I shall check it out. Thanks! Are you Canadian? you should visit one day. Most of my family is in Toronto. I prefer a smaller City. My sister used to live by the waterfront, like a stone throw away. It was awesome. Toronto is 50 minutes from here. No! But we have a special connection with Canada, we love it! The people are super friendly, down to earth and the general atmosphere of the country is awesome. We spent our honeymoon getting lost in the Canadian Rockies, we went to Alberta, Edmonton, Banff, and our last stop was in Lake Louise, it is a heavenly place to visit, the views, the nature, the animals, I can go on endlessly about this topic. I saw the likes just now and remembered this message. I’ve been rather pressed for time. I am so glad you love Canada. I adore it too! That must have been one hell of a honeymoon. I am yet to visit lake Louise. My friend recently moved to Alberta and am planning a big trip out there sometime this year. She loves it there except for the cold. Have a great weekend. I can imagine. I love travelling but sometimes I just can’t afford it. I hope to travel more once all my kids go to college! That is my goal too, just another 15 years and I will get there with my children! Ha ha that is an awfully long, long time. 15 years ago I used to say that. Now it’s just around the corner. Years fly by. You’ll soon get there!